This was the end of our group tour. Our plan since we had booked the tour was to go back to Barcelona for four nights. We had breakfast in the hotel and told a lot of people good bye. We took a taxi to the train station. It was only five block away, and we had walked it before but we didn’t want to walk pulling our suitcases. I don’t think the taxi driver was too happy about such a short ride. We got to the station early. We had booked our train weeks before we left. My wife worked many hours trying to get on the web site and purchase the tickets. If tickets were purchased from the Renfi web site sixty days in advance we could buy them at considerable discount . We went down one floor on an elevator and were able to figure out the train. Times are posted 20 minutes before departure. My wife bought an English newspaper. 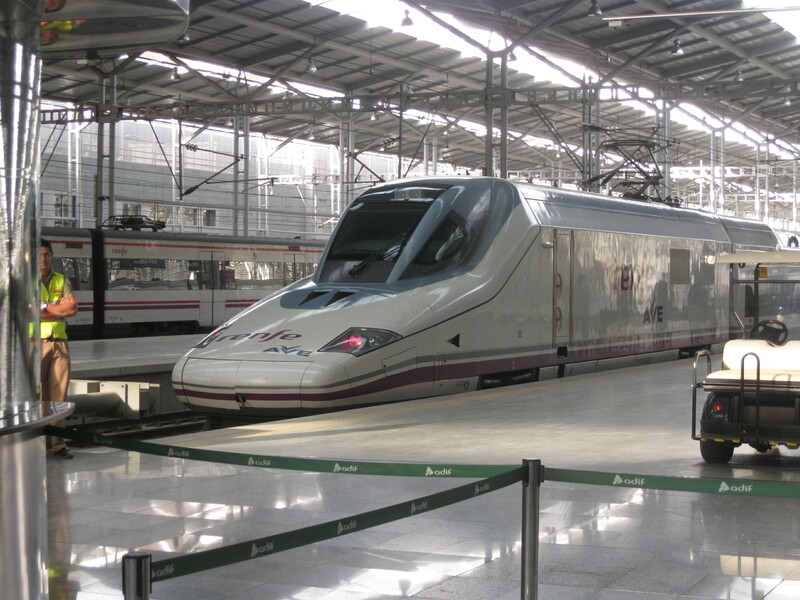 We boarded the Ave’ train to Barcelona at 10:00 am. It took about three hours traveling 300 miles per hour. 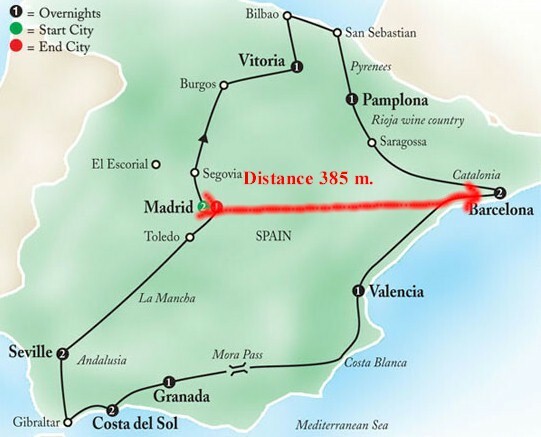 It is 385 from Madrid to Barcelona. The usual slow train takes about seven hours. It was about 1:00 when we arrived in Barcelona. We took a taxi to our hotel, Hotel Duquesa de Cardona. We had reserved this hotel several months in advance. 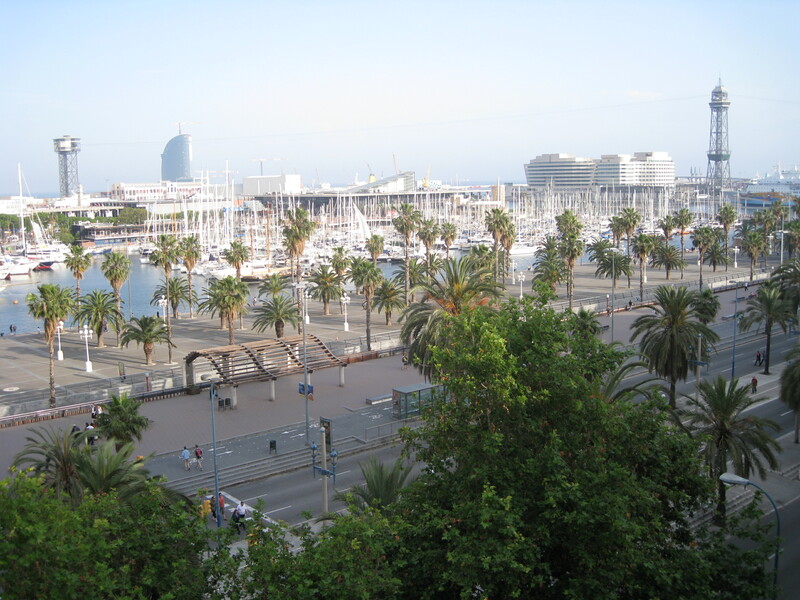 It was located on Passeig Colom which runs parallel to the beach and is three block from the Ramblas. 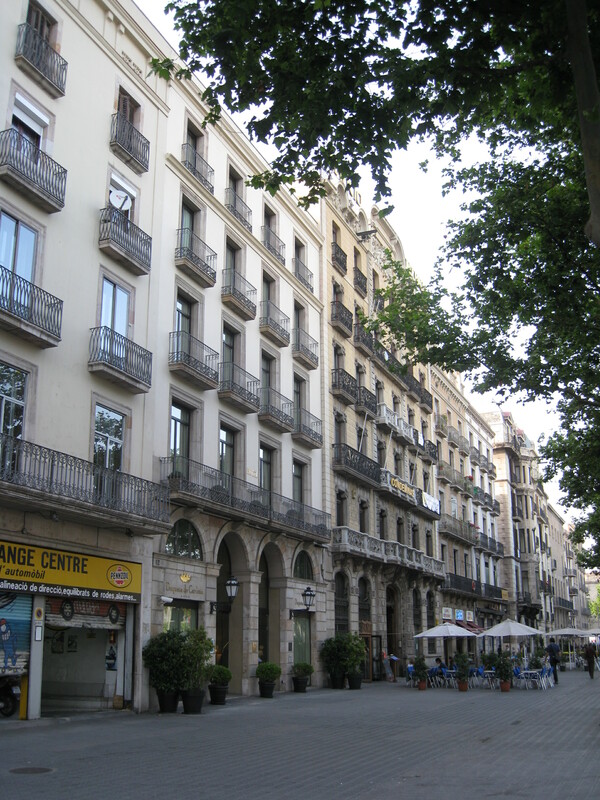 We had stayed several blocks up the Ramblas on the tour visit to Barcelonia. 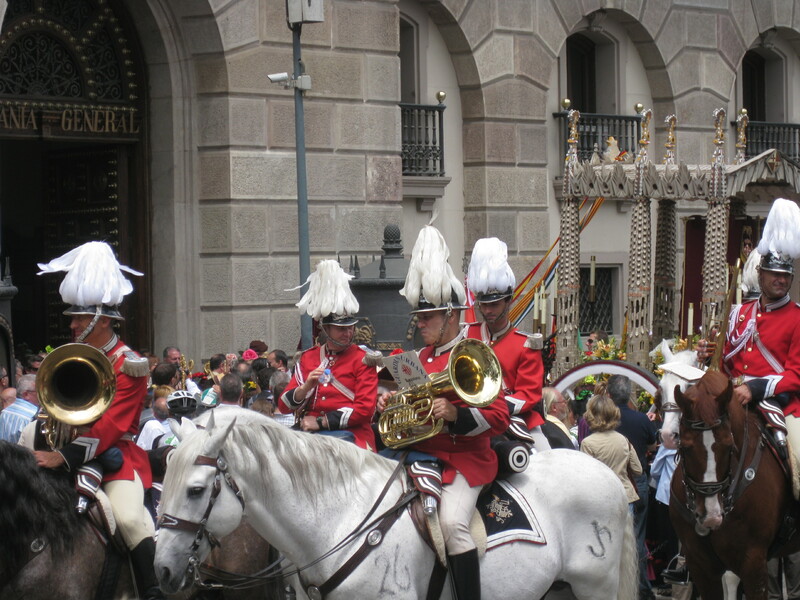 The taxi had to stop about a block from the hotel as the street was blocked for a parade. We checked in but our rooms wouldn’t be ready until 3:00. We walked down the street and stopped at a sidewalk café, Sailor’s. We order “the menu”. I had lamb and a salad and my wife had fish soup and paella. We went back to our hotel and our rooms were ready. We had a junior suite which consisted of a large bed at one end and a sofa and two comfortable chairs at the other end, a small room at the entrance which was like a little office with a desk, a dressing room and a large well equipped bathroom. My wife took a nap and I read. We had a wonderful view of the harbor from our little balcony. My wife’s sister had given us the name of a friend who used to live in Austin, Texas and now lived in Barcelona. We had contacted Brendan before we home left about having dinner with us. We called him and he said he would met us at our hotel. After Brendan met us, we went down a very narrow streets near the hotel to a restaurant, McDalgo. It looked like a hole in the wall from outside. Brendan had been there before and knew some of the staff. We sat on padded benches around a low table. There was a lot of loud music. We had a good meal. I had fish and chips and my wife had fish. We had a good visit with Brendan.